For the matriarch’s birthday dinner recently, we trooped on back to Vetro – the food was good last time and it’s pretty close to home, so why not? Once again, service was superb (thanks Tommy!). 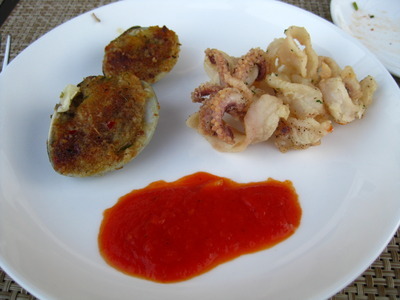 Our appetizers were served to us – the above, baked clams (yum) and fried calamari (lightly breaded, not too crisp but very tender). 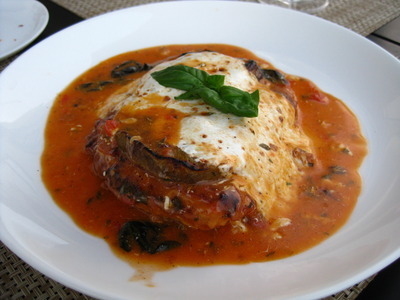 BF ordered a chicken cutlet dish that was layered with eggplant, which he enjoyed but had to pull apart to eat more easily. He even said later that he liked it a lot, just found it a little difficult to eat all together. 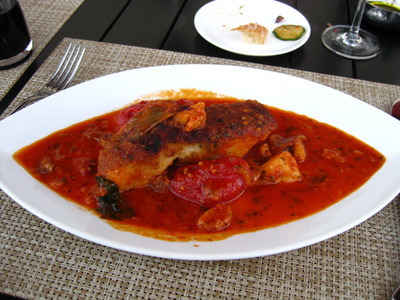 I ordered a lovely Chilean sea bass dish and was surprised when it came in a tomato sauce. I’m not entirely sure why I thought it was going to be a creamy sauce, but either way, it was tasty, just surprising since I feel like I don’t often see tomatoes with fish. I liked the way the flavors worked together, though, I’ll be honest, had I known it would be tomatoes, I wouldn’t have ordered it. As it was, I was happy I had – opened my eyes to a different way to prepare fish. BF’s sister-in-law ordered the shrimp scampi. I’ll have to assume she liked it quite a lot, since she and her husband (BF’s brother) had gone to Vetro the week before for their anniversary, and she’d ordered the same dish then. It looks good, and if I recall correctly, when we’d gone in February, I’d had a piece of shrimp scampi and enjoyed it. Yvo says: Once again, Vetro doesn’t disappoint. I liked the food and would definitely go back for another special occasion meal. Despite us not having been back since February, the waitstaff remembered us (in all fairness, we knew some of them before then as well) but also remembered what we’d ordered in terms of wine and food. Excellent service and above average food; I know we’ll be going back for future occasions. 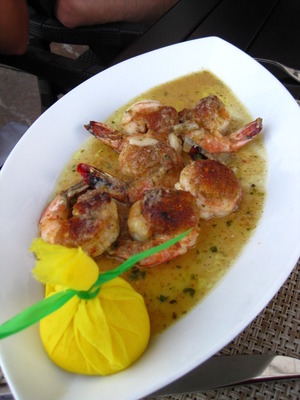 I don’t want to be a complete noob here – but what is the yellow tissue paper looking wrapped thing on the scampi? Just curious. And I thought this was the matriarch’s birthday – so I thought that meant Momma Feisty [?] – Or are you the matriarch? ‘Cause I know when your birthday is and you still have a wee bit over a month. hee. What did the matriarch eat? Funny story about the little “gift” : a very long time ago, I went to a restaurant and saw someone ordered a seafood dish and had one of those. I got excited because it looked like a gift and I thought it was sooo cute, I had to have it. When my dish arrived, I discovered… it was half a lemon wrapped in mesh. It took me a long time to figure out it was so you can squeeze lemon over your dish without dropping seeds into it. Cute and smart, right? Me, not so much. But the mesh-wrapped lemon, yes!!! Hahaha.